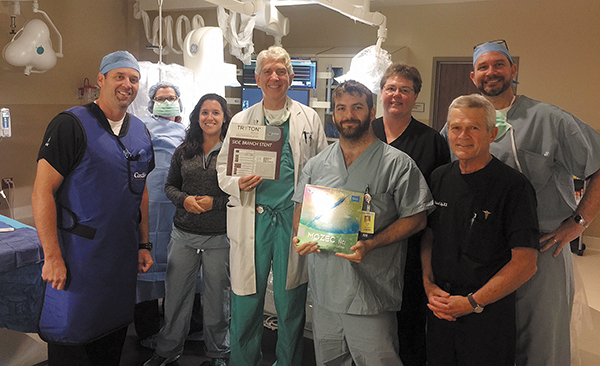 A TriStar Centennial team led by interventional cardiologists Dr. Paul Myers (front row, far right) and Dr. Jeffrey Webber (center) recently utilized the new Tryton Side Branch Stent. Two new innovative procedures for heart and spine debuted in Middle Tennessee last month, bringing patients and referring physicians new options for care. In late October, TriStar Centennial Medical Center announced completion of Middle Tennessee's first procedure utilizing the Tryton Side Branch Stent to treat a coronary bifurcation lesion involving a large side branch 2.5 mm or greater. The procedure was performed at TriStar Centennial Heart and Vascular Center led by Paul Myers, MD, in collaboration with Jeffrey Webber, MD, who are both interventional cardiologists with Centennial Heart. "This innovative and comprehensive approach allows us to treat patients with complex and high-risk blockages that involve arteries with important larger branches off the main heart artery," said Myers. Approximately 20-30 percent of patients undergoing percutaneous coronary intervention (PCI) to open blocked arteries have a bifurcation lesion. While provisional stenting of the main branch is the current standard of care, the side branch is not stented in many cases and can be compromised by shift of plaque from the main vessel into the side branch. Myers said the side branch stent allows for total accommodation of the anatomy of the bifurcation without blocking the blood flow to the smaller vessels with an end result of more predictable patient outcomes and less likelihood of artery plaque shifting into larger side branches after a stent implantation. The Tryton Side Branch Stent is a cobalt chromium stent based on Tri-ZONE® technology engineered to provide complete lesion coverage. It is deployed in the side branch artery using a standard single wire balloon-expandable stent delivery system. A conventional drug eluting stent is then placed in the main vessel. In February 2017, the Tryton Side Branch Stent became the first dedicated bifurcation stent to receive regulatory approval in the United States. Juris Shibayama, MD, an orthopaedic surgeon with Tennessee Orthopaedic Alliance in Smyrna, recently performed minimally invasive, same-day, outpatient lumbar surgery. "The minimally invasive transforaminal lumbar interbody fusion (MIS TLIF) is all about reducing the collateral damage done to the tissues during surgery," said Shibayama. "Rather than stripping and burning the muscles off the spine in a traditional open approach, doing it this way preserves the muscles and ligaments. The procedure is done by dilating the muscles; therefore, there is no trauma to the muscles and ligaments to the spine during the surgery." Shibayama has been perfecting the spinal fusion procedure for the last eight years. Traditional open surgery typically requires a hospital stay of two to three days. Shibayama had already reduced hospitalization to an overnight stay for observation before moving to an ambulatory setting this fall. "Spine surgery today is where sports medicine was 50 years ago," said Shibayama. "That was when arthroscopy was just becoming popular." He noted at the time, many surgeons thought the newer technique wouldn't take off, as it would prove to be inferior to open surgery. Instead, he said, "Doing the surgery arthroscopically allowed surgeons to have great visualization and perform an excellent surgery without causing collateral damage." 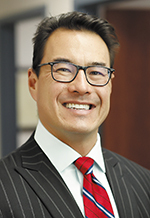 Recognizing most spine surgeons have similar hesitation over minimally invasive procedures, Shibayama noted, "I have never had a deep infection with this surgery, nor have I ever had to return the patient to the operating room for repair of a dural tear. That reduction in complication rate alone is a massive advantage ... but in addition to that, the post-operative pain is much less to the point where the surgery can be done as an outpatient." Other advantages, he continued, are a much abbreviated recovery time and faster return to work and normal activities. "There is no doubt in my mind that this is where spine surgery is headed, and I'm excited to be able to bring these advances to Middle Tennessee," Shibayama concluded.